The cathedral of Morelia Morelia (mo-REH-lia), a city of about 1 million, rests on a gentle sloping hill overlooking the Valley of Guayangero and is another of Mexico's colonial gems. It is a UNESCO World Heritage Artistic sight. At an elevation of 6,399 feet above sea level, Morelia's climate provides spring-like days throughout the year. The city and surrounding state of Michoacan offer a refreshing addition to any colonial city tour itinerary. 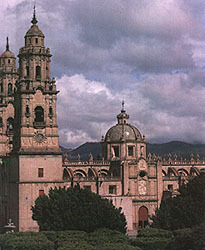 Morelia is the capital of Michoacan, a land of immense beauty. Michoacan is a the colonial Spaniards translation of the Nahautl word, Mechuacan which means "place of land of the fisherman". Greener and more rustic than the neighboring state of Guanajuato, Michoacan's countryside is a vast expanse of rolling hills, deep lakes, winding rivers and green valleys. Much of the state is dominated by a volcanic mountain range, the Cordillera Neovolcanica. Volcanic activity and the state's latitude position creates a setting not unlike Hawaii, especially near the coast. Rich soil supports lush jungle-like vegetation, with spectacular mountain landscape, and velveteen pasture lands. Traditional fishing on Lake Patzcuaro The state has few large cities, but rather a collection of small villages and towns that have changed little since the 1800's. It's pace is leisurely, its people friendly, and its Spanish colonial and indigenous heritage rich. Morelia is one of Mexico's most endearing cities - wonderfully restful and clean with wide boulevards, lovely squares, and shady parks. 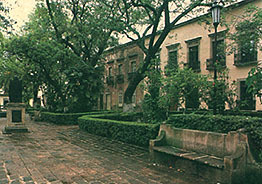 Architecturally, the city is of the 17th and 18th century Spanish colonial style. Despite some unattractive urban sprawl, Morelia proudly displays numerous masterfully restored mansions, churches, and civic buildings.. Most are oft pink-colored stone with lacy, delicate facades. The city's layout is a classic grid design, with a central square. Shopping, Museums, and historic attractions are within a few blocks of the square. Aside from its historical attractions, Morelia is also the educational, cultural and political center of the state. 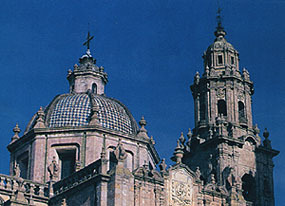 Morelia makes an excellent choice for foreigners studying Spanish and Mexican culture. It is also the home for dozens of writers, artists, philosophers, poets, and a community of retired Americans and Canadians. Morelia also boasts a fine convention center (capacity 1,200), coupled with a modern planetarium and greenhouse with over 4,500 species of plants. Within a couple hours drive from the city, the state's deep indigenous roots come alive in villages that make excellent day trips from Morelia. The Peso presently values beween 9-10 Pesos to 1 US dollar. Banks generally have the best exchange rates & open at 9am (M-F), make sure you check what hours they do money exchanges. Lines may be longer at banks, but rates are probably better than exchange houses. Money exchange houses or Casa de Cambios are found Morelia and will exchange money throughout the day and into the early evening. Check with your hotel also as they may exchange money. Both of the options may be a little higher than the banks, but are probably more convenient. Most of the larger establishments - from restaurants to shops, will readily accept US currency. The issue in that case will be the exchange rate that they offer; it is advisable to ask first in order to avoid any disappointments. Also, whether paying in Dollars or in Pesos, it is a good idea to carry small bills with you, as it is often difficult for small shops or stands to make change for large bills. If you head for the surrounding countryside, make sure you have some pesos. Some of the hotels, shops and restaurants will accept credit cards, with some or no surcharge, but not all of them. However, you have to keep in mind that many other establishments - especially smaller ones with lower prices, do not accept credit cards. While you are planning your trip, make sure that you carry - or have access to, enough cash or traveler's checks. Morelia is in the Central Time Zone. During the summer months, most businesses are open. Since Morelia is the capital and doesn't really have slow season, siesta isn't usually observed except in some of the small towns outside the colonial city. Siesta or the mid-day break is a tradition that reflects not only the necessity of avoiding heat-related fatigue, but is also a traditional time to spend with family. It coincides with the hottest time of day when people retreat to their homes to eat and rest in the shade. You can call (direct dialing) and fax to anywhere in the world from Morelia, using the facilities at your hotel or a telephone calling place or Larga Distancia shop. You can also purchase pre-paid long distance cards before you leave (see Travel Services) or you can buy then throughout town. Internet access is now available throughout Morelia in "cyber cafes", some hotels may also offer the service. Morelia has an international airport. Flights arrive at Francisco J. Múgica airport daily. The airport is about 15 miles from Morelia. Several shops are open, plus a restaurant, bar, and several rental car agencies. From the airport, taxis are available at around $16-$20 depending on what city zone you are headed to and it's about a 30 minute ride. Most major rental car companies have airport counters. To fly (international airports), you will need a valid passport, or your original birth certificate (US and Canada) plus a vaild photo ID. It must be presented at the airline check-in. Once on the plane you will be given a form to fill out - for customs. Tourist cards are not necessary and cost about 150 pesos. There are restrictions as to what you can bring to Mexico......Some of these restrictions are limits for "duty free" and some are absolute, such as firearms without a permit (not to mention drugs). Firearms - only for hunting and a permit must be obtained from the Mexican Consulate in advance. The Immigration counter is your first stop after you disembark the plane. Here you will have to present your passport (or birth certificate). Your passport will be stamped to make your arrival official. (You will need to keep your passport with you at all times while in Mexico) Next you'll proceed to the baggage claim area for your luggage. Customs is the last step, here you will need to have your Customs Declaration Form handy (the form you were given on the plane). Recently Mexico adopted a "Red Light - Green Light" system for customs. If you have put "Nothing to declare" on this form, you will be asked to push a button....... If the light is green you can exit without inspection; if the light is red you will be subject to inspection. This is a random system, and therefore there is no way to know whether you will get a green or red light. Consequently you need to be honest on your Customs Declaration and declare anything over and above what is allowed, paying all applicable duties. If you do not, and are caught by a red light, the fines may be very steep. 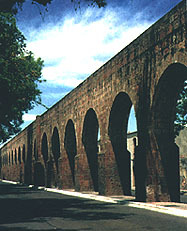 Morelia can be reached by driving from Mexico City (315 km.) and Guadalajara (367 km.). The highways in the area are modern and well-kept. If you do drive your vehicle to Morelia, you must have Mexican auto insurance, it's the law. Please see Travel Services under the Travel & Lodging directory for a list of companies. Central de Autobuses can be found near the center of town on Eduardo Ruiz V. near V. Gomez Farias. Most major bus companies serve the city offering services from first class, luxury trips to inexpensive, budget trips. Buses head out to many cities in Mexico daily, including Mexico City every 30 minutes. Local lines leave for Patzcuaro and other small towns in Michiacan throughout the day. Morelia's colonial (and main tourist) area is easy to walk with most attractions a couple of blocks in any direction from the main plaza. The bus station is only about 5 blocks away. Morelia also has public bus service and combis (small vans) running throughout the town. Taxis are plentiful, and should be taken at night after bus service stops.